Are you having a painless, reddish brown lump on your skin? If you have, it may be a Dermatofibrosarcoma Protuberans tumor. Read on to know all about Dermatofibrosarcoma Protuberans, its causes, symptoms, diagnosis and treatment. 1 What Is Dermatofibrosarcoma Protuberans? 2 Who Gets Dermatofibrosarcoma Protuberans? 6 What Causes Dermatofibrosarcoma Protuberans? 11 Does Dermatofibrosarcoma Protuberans Recur? Dermatofibrosarcoma Protuberans is a rare tumor arising on the dermis of the skin. It can sometimes become a sarcoma, a type of malignant tumor developing from the connective tissue of the muscle or the bone. It is regarded as one of the four major kinds of cancer in such cases. Dermatofibrosarcoma Protuberans sufferers are mainly adults. The disease is very occasionally seen in children. It generally affects adults between 20 and 50 years of age. The condition is rarely reported in newborns and aged people. Recent cancer studies have also shown that men are slightly more likely to have this disease than women. 4.4% males suffer from this disorder as against 4.2% females per year in every one million population. Dermatofibrosarcoma Protuberans tumors generally arise on the trunk. About half the people suffering from this disease have these bumps arising on their trunk. Head and neck are the next common regions where these lumps arise. According to studies, the disease affects 1-5 people in every one million population in the US per year. About 4 in 1 million people in the US have suffered every year from 1973-2002. The disease is mainly characterized by the appearance of tumors on the skin surface. The tumors develop as hard bumps over the skin. They are usually flesh-colored though they can also appear reddish-brown or reddish-blue in many cases. The lumps are mostly painless. The Dermatofibrosarcoma Protuberans tumors are generally asymptomatic, meaning they do not produce any symptoms. They can be between 1-5 cms in length in the early stages. 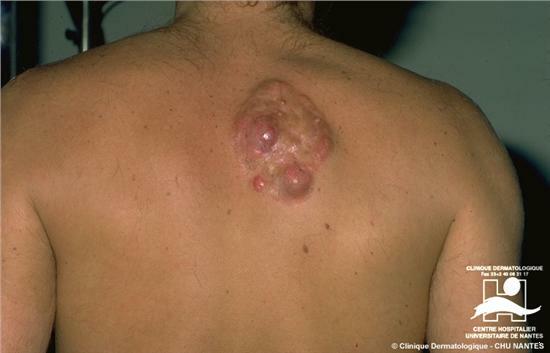 Dermatofibrosarcoma Protuberans bums are often found on shoulders or chest. But they can also be found on other parts of the body. In rare cases involving malignancy, these can metastasize or spread to other tissues of the body. Malignant conditions can be very harmful for the health of a sufferer and can also involve death if not treated properly in the early stages. Dermatofibrosarcoma Protuberans tumors arise due to a rapid division of cells which eventually results in an abnormal mass on the skin. Two specific genes, the growth-factor gene and the collagen gene, fuse to produce a growth factor that stimulates the abnormal growth of the tumor. The tumor looks like a small harmless bump under the skin in the initial stages. With passing time, it may spread into the muscular tissue and probably also affect the surrounding organs. In case of Dermatofibrosarcoma Protuberans MRI scans are very assistive in evaluating the extent of the spread of tumor. Open Incisional biopsies and core needle biopsies are also very helpful in diagnosing this condition. In case of a core needle biopsy,a hollow needle is passed into the organ through the skin. A sample of cell is removed and tested for abnormalities. A skin biopsy is highly necessary for a definitive diagnosis of Dermatofibrosarcoma Protuberans. The differential diagnosis for Dermatofibrosarcoma Protuberans consists of distinguishing the disorder from other similar conditions like Myxoid Liposarcoma, Desmoplastic Melanoma, Fibrosarcoma, Lexiform Fibrohistiocytic tumor and Myxoid Nerve Sheath tumor. The treatment of a Dermatofibrosarcoma Protuberans tumor can be done in various ways. Surgery is the most preferred way of treating this condition. Surgery consists of complete removal of the tumor and also involves examining the surrounding tissues to check whether they have been already infested with cells sprouting from the bump. A Dermatofibrosarcoma Protuberans surgery generally has a high rate of success. An MOHS surgery can be very effective as a cure. It removes the tumor and all the neighboring pathological cells without making an excision in a wide region. In some people, Chemotherapy is used to shrink the size of the tumor. A mild drug known as Imatinib is also used in various kinds of Chemotherapy and has been found to produce effective results in some cases. In some cases of Dermatofibrosarcoma Protuberans Radiotherapy is also used along with Chemotherapy treatments. The prognosis for Dermatofibrosarcoma Protuberans cancer is a good one if detected in the early stages. Malignant cases of Dermatofibrosarcoma Protuberans are rare and are found in only 1-4% of sufferers of this disease. Chance of local metastasis is 1% while that of distant metastasis is 5%. Yes. Dermatofibrosarcoma Protuberans tumors can recur in some cases. Chances of Dermatofibrosarcoma Protuberans recurrence are high and the condition is seen to come back in 11-53% of sufferers. 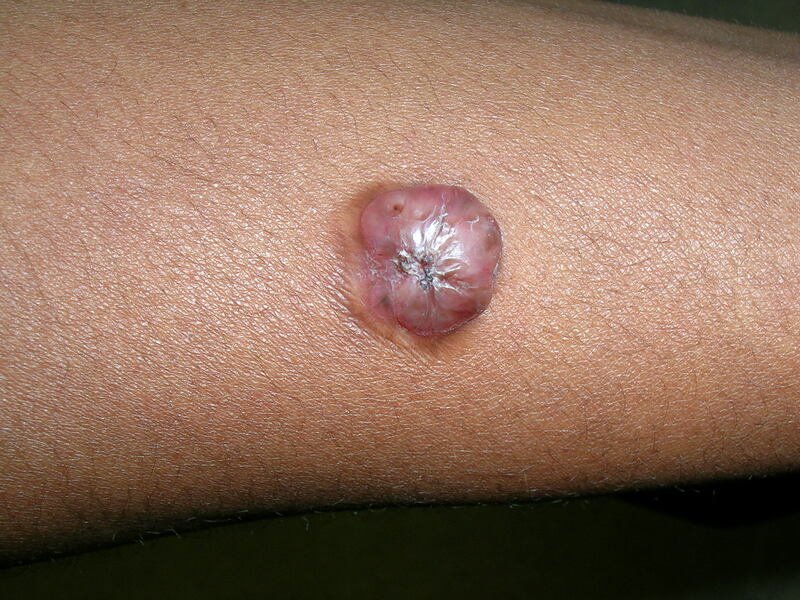 Dermatofibrosarcoma Protuberans is a localized disease and appears as a primary tumor. The condition metastasizes into the lymph nodes. There is Distal Metastasis involved with this disease. Dermatofibrosarcoma Protuberans tumors can lead to death if they turn malignant. In malignant cases of Dermatofibrosarcoma Protuberans survival rate is very low. Most individuals suffering from metastatic Dermatofibrosarcoma Protuberans die in 2 years. Want to check if the lumps on your body look similar to Dermatofibrosarcoma Protuberans tumors? Here are some useful Dermatofibrosarcoma Protuberans images that may help you. These tumors grow very slowly and are often neglected in the initial years. So if you suspect a Dermatofibrosarcoma Protuberans bump on your skin, get it checked from time to time with the help of a doctor. Early diagnosis and treatment will help you get it cured while there is still time. It is never advisable to delay treatment when your health is at risk.